Ready for the world to know about your art? No one is "discovered". It's all self-promotion. That was my biggest a-ha moment. I thought the galleries would do the promotion for me, but no, they don't. I wanted to hire a publicist but found out quickly that it was cost-prohibitive for the long-term. In the end I realized it was best if I could do it, myself. This tutorial draws upon my own experience and what I've learned from many others. 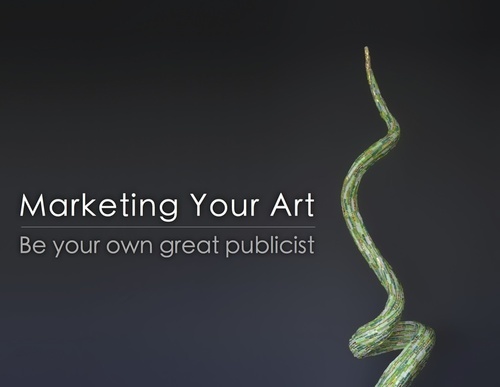 It gives you lots of practical advice, case studies, and ideas that you can use in marketing, branding, and publicizing your own art or craft business. It's the course I wish I could have taken when I was getting started in 2002. Learn all the things successful artists know but don't talk about. Find out how to get lots of free publicity, how to make your images really work for you, how to get featured in magazines, and how to get sponsors for projects. Get information about how to design your website to be your 24/7 sales team and how to attract clients to you, too. The Self-Study course is a tutorial. There is no homework and you can work at your own pace. Just to celebrate how much fun we're going to have in this course, you'll also receive a 20% discount on ALL my eBooks after registration.